General: Maintains and looks for opportunities to enhance operational procedures and systems. Provides excellent customer support and manages customer support team. Helps promote a company culture that encourages top performance and high morale. Has 3 direct reports in customer service/sales/office management. 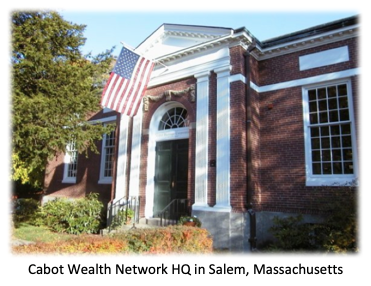 Cabot Wealth Network, founded in 1970, is one of the largest and most-trusted independent investment advisory publishers in the country, serving hundreds of thousands of investors across North America and around the world. Headquartered in Salem, Massachusetts, a short walk from the T train/bus station. Cabot Wealth Network is an equal opportunity employer.